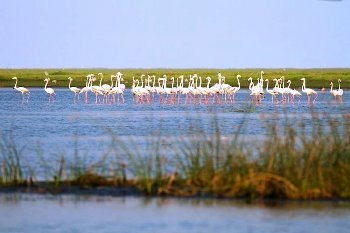 Nalabana Bird Sanctuary in the island of Nalabana is one of the major attractions of Chilika. The island with circumference of 8 kmilometres is a protection site that preserves contrasting species of the migratory birds. The sanctuary is home to thousands of migratory and regional bird species. and is hence considered as a delight for bird lovers. Birding enthusiasts can visit Nalabana Bird Sanctuary during winter months, when several migratory birds descend to the island from Siberia, Afghanistan, Iran, Iraq and Himalayas. Waterfowl such as Flamingos are the highlighting avian species. arriving at this island. Gulls, Terns, Eagles, Goliath Heron, Ardea Goliath, Herons, Eurynorphynchus Pygmaeus, Asian Dowitcher and Egrets are some of the common bird species that take shelter in the sanctuary. Along with these species, Golden Plover, Pluvialis Fulva, Green Sandpiper, Tringa Ochropus, Nalaban, Spoon-billed Sandpiper and Limnodromus Semipalmatus are some of the noteworthy species of the sanctuary.